1 Defeated Sting for the NWA World Heavyweight Championship. WWE recognized it as an NWA reign extended to WCW, but it is not considered as one of Flair's 16 world titles, which are made of 2 WWE titles, 6 WCW titles and 8 NWA titles. — Flair left for the World Wrestling Federation and was stripped of the title. 2 Defeated Barry Windham in a steel cage match. 5 Became first African American World Heavyweight Champion. — Title held up after Flair vs. Ricky Steamboat results in a double pin. This occurrence is unrecognized by WWE, who considers Flair a six-time WCW Champion, his first reign being an NWA reign extended to WCW. 10 Defeated Steamboat in a rematch. Aired on May 14, 1994. 11 This was Hogan's first match in WCW. 12 Won in a match where the title could be changed by disqualification. The Giant defeated Hogan by disqualification when Jimmy Hart interfered. — The Giant was stripped due to controversial finish of Halloween Havoc match. 13 Won in a World War 3 match. 16 Won in a Steel cage match. 21 Hogan first pinned Sting but guest referee Bret Hart accused the first referee Nick Patrick of making a fast count and restarted the match. Sting won by submission. — During this rematch from last night's Starrcade referee Randy Anderson was knocked unconscious and Nick Patrick came down, counted Sting's shoulders down and awarded the title to Hogan. After the match a brawl ensued during which Anderson came to thinking the match was still going on and attempted to award the bout to Sting. But no bell could be heard as the match had already officially ended when Patrick called for the bell. Sting however left with the belt while Hogan still claimed to be champion. The ending of this match was not shown on TV until the following Thursday. — Aired January 8, 1998. Held up due to controversy over finish of December 28 and December 29 matches. 22 Defeated Hogan in a rematch. 24 Won a no-disqualification match. 27 Nash laid down for Hogan. 28 Won a First Blood Steel Cage match. 29 Defeated Flair, Sting, and Hollywood Hogan in a four-way match. 31 Defeated Sting, Kevin Nash, and Goldberg in a No Disqualification Fatal Four-Way match. 33 Savage pinned Nash in a tag team match also featuring Sid Vicious and Sting; if Nash was pinned or if he had to submit he would lose the championship. — Sting is stripped of the title after losing a non sanctioned match against Goldberg and attacking referee Charles Robinson at Halloween Havoc. 36 Defeated Chris Benoit in a tournament final. — Hart vacates title because of controversial match with Bill Goldberg at Starrcade 1999. 37 Defeated Goldberg in a rematch. — Hart vacates the title due to injury. — Benoit forfeits the title and leaves for the WWF after dispute with management. 39 Defeated Kevin Nash after defeating the Harris Brothers for the right to wrestle Nash for the belt. — Stripped by Commissioner Kevin Nash due to Sid pinning the wrong Harris Brother. 40 Awards himself the title. Not listed by mistake in the title lineage at WWE.com. 41 Defeated Nash and Ron Harris in a handicap match by making Nash submit. Aired January 26, 2000. — All WCW titles were declared vacant by Vince Russo and Eric Bischoff after WCW was rebooted. 42 Defeated Dallas Page in tournament final. 44 Arquette pinned Eric Bischoff in a tag team title match also featuring Diamond Dallas Page and Jeff Jarrett; the wrestler who scored the decisive fall would be declared champion. Aired April 26, 2000. 45 Won in a Triple Cage match that also included Page. — Vince Russo stripped Flair of the title. 47 Awarded by Vince Russo. 48 Defeats Jarrett and Scott Steiner in a Triple Threat match. Aired on May 24, 2000. 49 Nash gave title back to Flair. — On orders from Vince Russo, Jarrett laid down in the ring and allowed Hogan to pin him for the championship. After which an argument ensues between Hogan and Russo. 51 After the controversial Hogan/Jarrett match, head writer Vince Russo announced that Jarrett would defend the title in an impromptu match against Booker T.
53 Won a Caged Heat match. 54 Won in a steel cage match. — Russo decides he is not a wrestler and he does not want the title. 55 Defeated Jeff Jarrett in a "San Francisco 49ers match". 56 Won in a "Straight Jacket steel cage match". 57 Won on the final edition of WCW Monday Nitro. 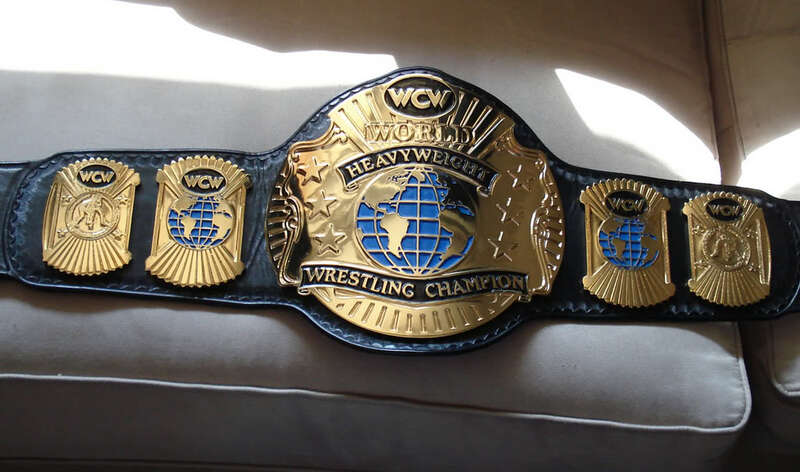 WCW was purchased by the WWF on March 23, 2001; title was simply referred to as "WCW Championship" afterward. 58 Became the first person to win the WCW Championship on WWF programing. Aired July 26, 2001. 62	The Rock	2	34	Raw	The title is referred to as simply the "World Heavyweight Championship" on November 19 after the demise of The Alliance. 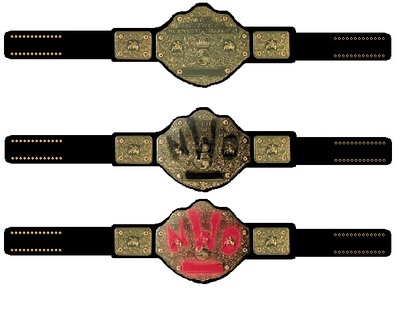 63 The World Heavyweight Championship was unified with the WWF Championship and the combined titles become known as the "Undisputed WWF Championship". - Unified with the WWF Championship when Jericho defeated Steve Austin to create the "Undisputed WWF Championship".